Having one client is already a challenging proposition, but having three on the same project boggles the mind. Hats off then to the UK-based Norwegian architect David Fjågesund for successfully navigating what must have been challenging, competing demands to create this bijou jewel of a sauna. Set in Dalen, a wildly picturesque spot in Telemark county, 160km southwest of Oslo, the project marks a remarkable collaboration – specifically between the Telemark Canal Regional Park, which owns the canal on which the sauna is located; the local Tokke municipality; and local landmark hotel, the Dalen hotel, the operator – in which art, architecture and lighting design are harnessed as part of a regional art project to highlight the region’s landscape and traditions. Named after a well-known Norwegian fairytale about a gold palace in the mountains, the sauna is the very definition of Scandi-functionality and minimalism. 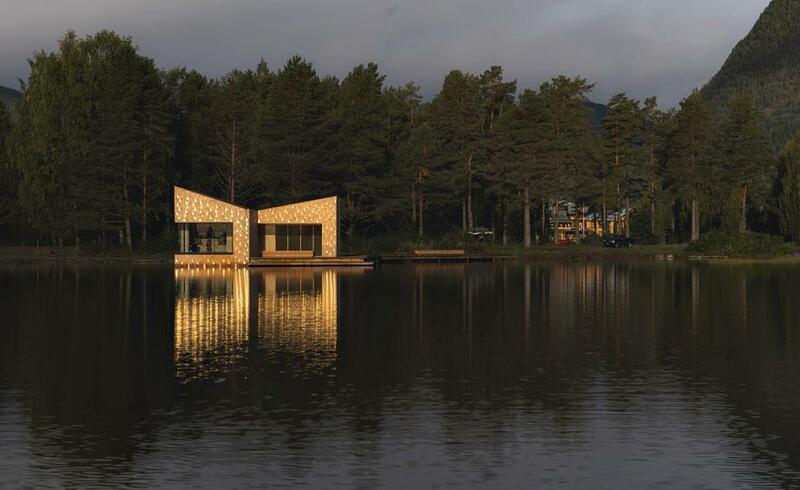 Its sharp-edged polygonal silhouette is a striking echo of the surrounding mountains; its warm interior lined with blonde timber and floor-to-ceiling windows takes in the entirety of the tectonic view; whilst the exterior of golden-hued metal and pine shingles and decking acts almost as a natural camouflage against the lake’s mirror flat surface. The sauna is appropriately egalitarian, with access available to guests of the Dalen, day-trippers, and stray mountain hikers.